Marjorie L. Houghton married James Carne. Sarah M. Houghton married (?) Kressler. June Miriam Shattuck married Hartwell Griffin in Sep 6, 1947. Hartwell Griffin married June Miriam Shattuck, daughter of Russell R. Shattuck and Florence Adella Durgin, in Sep 6, 1947. Holly Miriam Griffin married James Henry Robert in Mar 27, 1976. James Henry Robert married Holly Miriam Griffin, daughter of Hartwell Griffin and June Miriam Shattuck, in Mar 27, 1976. Mildred (?) married Roswell Shattuck, son of Russell R. Shattuck and Florence Adella Durgin. Sophia (?) married (?) Houghton. Sophia (?) married Orville S. Brigham. Birth MA, USA, VT in 1880 census of daughter Anna Houghton; MA in 1900 census of son Jerome; NH in 1910 census of son Emory P.
Sarah Houghton married William J. Connor in circa 1898. William J. Connor married Sarah Houghton, daughter of Catherine Houghton, in circa 1898. Sarah Jones married Richard S. Haughton. 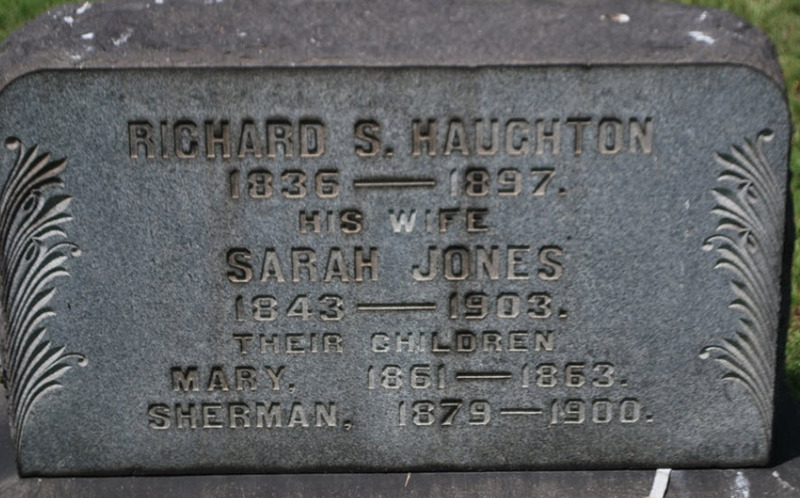 Richard S. Haughton married Sarah Jones. Cora Haughton married Fred Rose Gildersleeve.